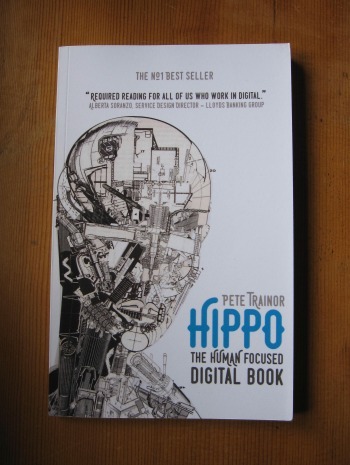 For Christmas I was lucky enough to receive Hippo The Human Focused Digital Book by Pete Trainor. I received a good collection of books for Christmas (not all UX focused) and so it joined the pile to be read some time this year. However when I realised he was speaking at the February UXPA event it seemed sensible to make it a priority on my reading list and so I was half way though by the time I attended the event. Pete was kind enough to sign my book before his talk and we had a little chat. It was very inspiring to find out that he is dyslexic, something I am familiar with. Pete is a great speaker and I found his talk interesting and inspiring. But I also found it really nice to hear him speak about the concepts in his book, some of which can get a little complex, although the overarching theme is simple enough. Design for humans. For such a slim publication, this book packs in a lot of information. Split into 13 short chapters it covers the real reasons why we should be designing for humans right from the very beginning of the design process. He also goes on to talk about the possibilities of the future, moving away from screens and making the most of artificial intelligence (AI). Each thorey is backed up with a diagram or formula to help with understanding and make it memorable, meaning these are ideas that you can use right away in your work. If you are working on anything digital you really should be thinking about this stuff and Pete’s book is a great place to start. And in case you are wondering the hippo of the title is the hippocampus a critical brain region for forming contextual associations.